June 12, 2017: Most summers, jewel-toned hues appear in the Black Sea. The turquoise swirls are not the brushstrokes of a painting; they indicate the presence of phytoplankton, which trace the flow of water currents and eddies. 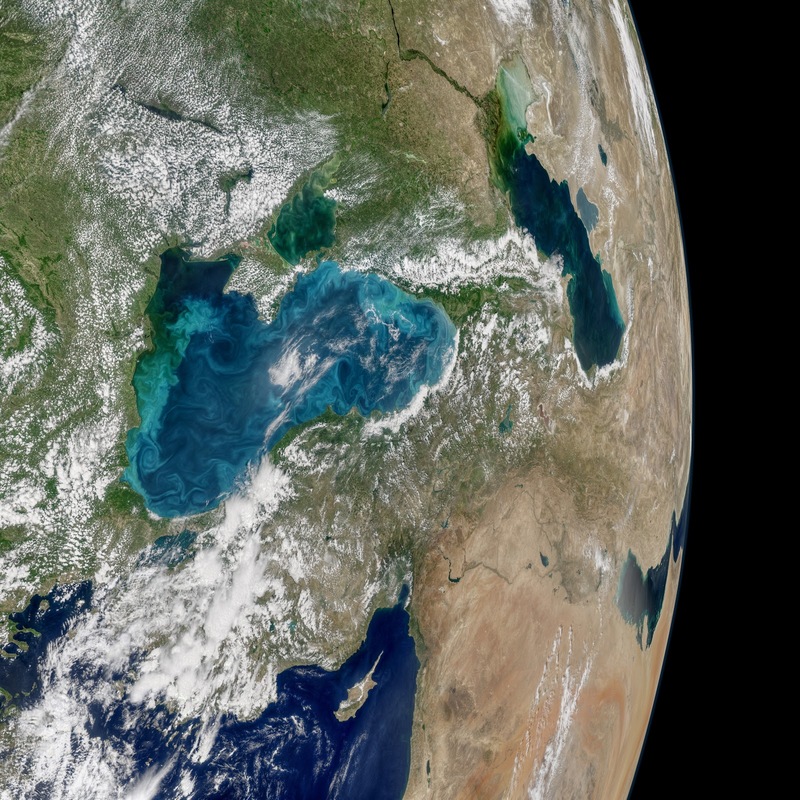 On May 29, 2017, the Moderate Resolution Imaging Spectroradiometer (MODIS) on NASA’s Aqua satellite captured the data for this image of an ongoing phytoplankton bloom in the Black Sea. The image is a mosaic, composed from multiple satellite passes over the region. Phytoplankton are floating, microscopic organisms that make their own food from sunlight and dissolved nutrients. Here, ample water flow from rivers like the Danube and Dnieper carries nutrients to the Black Sea. In general, phytoplankton support fish, shellfish, and other marine organisms. But large, frequent blooms can lead to eutrophication—the loss of oxygen from the water—and end up suffocating marine life. One type of phytoplankton commonly found in the Black Sea are coccolithophores—microscopic plankton that are plated with white calcium carbonate. When aggregated in large numbers, these reflective plates are easily visible from space as bright, milky water. “The May ramp-up in reflectivity in the Black Sea, with peak brightness in June, seems consistent with results from other years,” said Norman Kuring, an ocean scientist at NASA’s Goddard Space Flight Center. Although Kuring does not study this region, the bloom this year is one of the brightest to catch his eye since 2012.